UPDATE: It's Back! 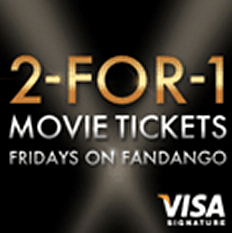 Enjoy BOGO movie tickets from April 22nd - Aug 21st 2015! Buy one movie ticket, get one free! ONLY available on FRIDAYS. It won't work if you try on a day that is NOT Friday. You MUST have a Visa SIGNATURE credit card to make the purchase with. HERE is a list of credit cards that might qualify. Usually it will say "Signature" under the Visa logo. You can get this offer once per month per credit card...so if you have multiple Visa Signatures credit cards this is not an issue. Ends Aug 21st and the deal is while supplies/tickets last. This offer has been happening every summer so if you miss out this summer, there is always next summer. 1. Enter all 16 digits of your Visa Signature card number to ensure you are eligible for the offer. Your card will not be charged until you confirm your purchase on the check-out page. The card number is used for verification of eligibility for the offer. Your information is transmitted over a high level encryption (SSL) and is not used for any other purposes. 2. Once you are verified, search for available movies. 3. Enter your ZIP code or city name in the box provided to find theatres in your area that offer online ticketing through Fandango. 4. Choose your Friday show date, theater and movie. Click on a show time listed in red to purchase tickets for that Friday show. 5. Enter the number of tickets you would like. You must select at least two (2) tickets to participate in this offer. 6. Enter your Visa Signature card number to pay for your order. On the Review page you’ll see the price of one ticket and the convenience fee for one ticket deducted from your order, up to $19.50 total, compliments of Visa Signature. 7. Complete the purchase process and follow the instructions on your confirmation page to claim your tickets at the theater. Does Fandango charge a fee?